Discover Noosa’s top 7 secret and not-so-secret wedding ceremony locations that will make your Noosa beach wedding memories ever-lasting. When you think of Noosa wedding venues, pictures of calm protected Laguna Bay come to mind with Noosa National Park looking down over its pristine white sands. 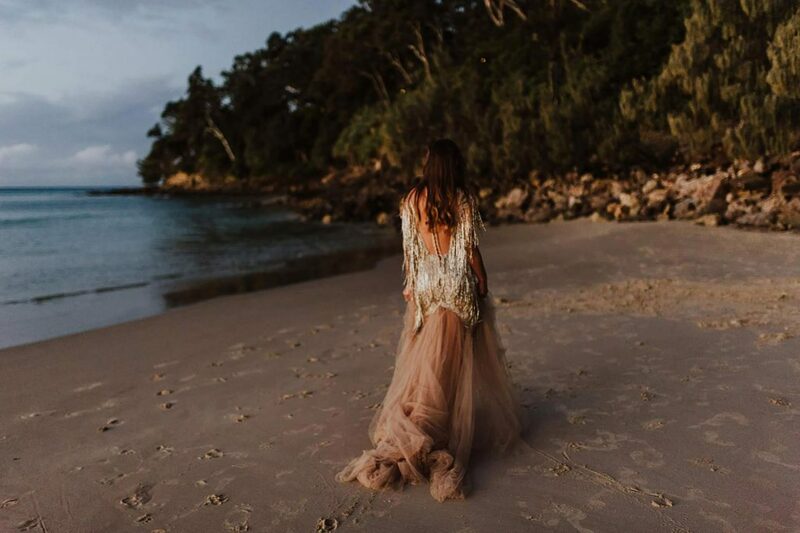 Noosa’s beaches, bays and hidden gardens provide the perfect setting for any romantic beachside wedding ceremony. We’ve found seven idyllic locations to help you decide the best-hidden position for your perfect beach Noosa wedding venue. First Point is a picturesque beach frontage wedding location tucked into the protected corner of Noosa Main Beach. With stunning views over Noosa’s pristine white sands and Laguna Bay, First Point offers a small grassy area and a comfortable space suitable for weddings of up to 40 guests, just footsteps from Locale Ristorante + Bar. A little further east past First Point is secluded Little Cove beach. Overlooking Laguna Bay with a view back to Noosa Main Beach, it’s the perfect spot to capture gorgeous golden sunsets and host a private beach wedding only moments from Hastings Street. A small but beautiful beach where the waves lap at the surrounding rocks, Little Cove is accessed by steep wooden stairs with the deck offering an intimate location for small private weddings of up to 15 guests. Comfortably accommodate 20 guests if you’re on the sand. Very limited parking is available at Little Cove but a short stroll along the boardwalk will get you here from the Hastings Street dining precinct. Noosa Woods offers a stunning riverside backdrop for your Noosa wedding ceremony. It is the first park reserve at the end of Hastings Street and is suitable for all wedding sizes and styles. Noosa Woods on the river has a lovely wooden jetty perfect for wedding photos or arriving in style by boat (see Gondolas of Noosa). With plenty of parking spaces, sheltered areas and protection from onshore winds during October, it makes a great alternative setting to a beach wedding to consider. A local Noosa wedding planner can help you to plan and style your event and transform your space into a romantic outdoor garden ceremony, before making your way to your Noosa wedding reception venue. Maison La Plage Grove is one of the most popular Noosa beach wedding locations with grass underfoot and a stunning blue beach backdrop. Located in front of Maison Noosa Resort on Hastings Street, Maison La Plage Grove is a manicured open lawn surrounded by native bush with beach views through the trees. You’ll find this secret location along the boardwalk at beach access number 17 with capacity for up to 200 seated guests. Adjacent to Maison La Plage Grove at beach access 17, Casuarina Grove offers a natural setting for your beach wedding. Situated in front of Sandcastles Resort at the end of Hastings Street, Casuarina Gardens accommodates up to 60 seated guests with open views to the beach through the trees. The Casuarina trees provide a relaxed, intimate setting and shaded relief from summer heat and should definitely be considered for your Noosa beach wedding. Hidden away in the trees east of Noosa’s beach access number 16 is Hidden Grove. A natural tree-filled setting with open views to the blue waters of Laguna Bay, Hidden Grove is large enough to accommodate up to 100 guests while still feeling small and intimate between the trees. You’ll feel cool and protected in the shade while still adoring beach views. With this setting further towards Noosa Groyne, you’ll feel more secluded while still an easy walk or short drive to Locale at the opposite end of Hastings Street. To the left of Hidden Grove between beach access 14 and 15 and just passed the rock wall is The Groyne. Suitable for weddings with up to 50 guests, this location is hidden between native trees with a stunning view of the beach. Enjoy warm sunlight filtering through the trees in the afternoon and a warm romantic coastal setting sheltered by the trees. If you’re looking for a private Noosa beach wedding with sand between your toes, then this is your spot. Located at the western end of Noosa beach halfway between The Groyne rock wall and Noosa River entrance, the beach at access number 12 is less frequented by swimmers while still offering a wide sandy beach setting. Setup your beach wedding for up to 60 guests and intrigue with decorations along the pathway from the carpark through forested dunes to the beach. Once you’ve chosen the perfect location for your Noosa wedding ceremony, you’ll need to apply for the appropriate council approval. For Noosa beach wedding locations, your wedding must take place outside the restricted areas between First Point and Middle Groyne. The Noosa Council website provides important information on how to apply for approval, associated costs and things to consider. With your secret Noosa wedding location now found, find out what you need to choose the perfect Noosa wedding reception venue and start planning your Noosa wedding. View our wedding packages online or for more information on a Noosa wedding package that suits you, phone us today on (07) 5447 5111 to receive a personalised quote. This entry was posted in Noosa Weddings. Bookmark the permalink.